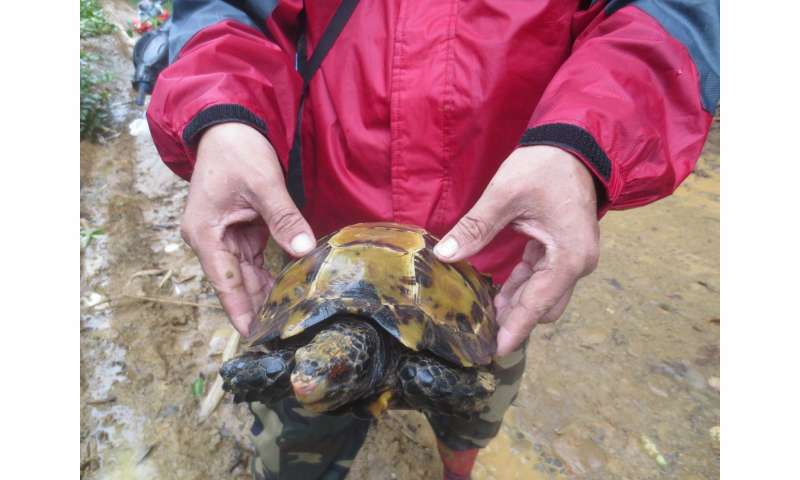 WCS scientists have discovered the impressed tortoise (Manouria impressa) in the Hukaung Valley Wildlife Sanctuary in northern Myanmar, some 528 miles from its known range in that country. The researchers reported their finding in the latest issue of the journal Asian Herpetological Research. Previously, the little-known tortoise was believed to be restricted to western Myanmar, along with pockets of habitat in Thailand, Laos, Vietnam, Cambodia, and southern China, and south through Peninsular Malaysia. Found by a @WCSMyanmar-led research team, the tortoise was crossing the famous Ledo Road—a rugged dirt track critical to Allied supply lines in WWII. It was examined and photographed before being released into dense cover adjacent to the road. Manouria impressa is considered Vulnerable to extinction by IUCN due to a combination of unsustainable subsistence harvesting, over-collecting for commercial wildlife markets in southern China, and widespread habitat destruction. It is related to the Asian forest tortoise (Manouria emys), which can weigh up to 55 pounds, though this species is much smaller with adults measuring only 14 inches across its carapace. Said co-author Steve Platt of WCS: "Because the species is extremely difficult to maintain and propagate in captivity, protecting wild populations is the recommended conservation option. Given its size, relatively low human population density, and widespread availability of suitable upland forest habitat Hukaung Valley Wildlife Sanctuary could play a vital role in future efforts to protect it." Platt notes that political and civil instability in the region has curtailed conservation efforts for the moment.